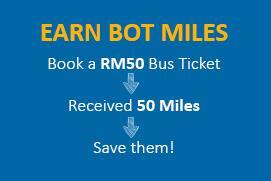 Earn BOT Miles by making a booking on the BusOnlineTicket website, for any of our bus tickets within Singapore and Malaysia. Every S$ 0.40 or RM 1.00 ringgit you paid worth one point and you can accumulate these points to redeem your discount code worth up to S$20.00! 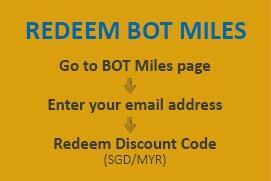 What’s more exciting about BOT Miles is that you don’t need to sign up to become our member to enjoy this rewards. As long as you use the same email address to make the booking and the reward points will be instantly accumulated to your email address. Is just that simple! Please click this link to check / redeem your discount code. For our existing customer, all your bookings from 1st January 2014 onwards will be automatically included in the reward points. 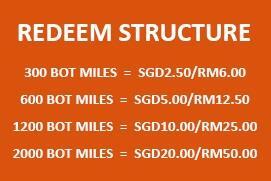 That means you can start redeem your BOT Miles instantly if you have accumulated S$ 300 / RM 750.